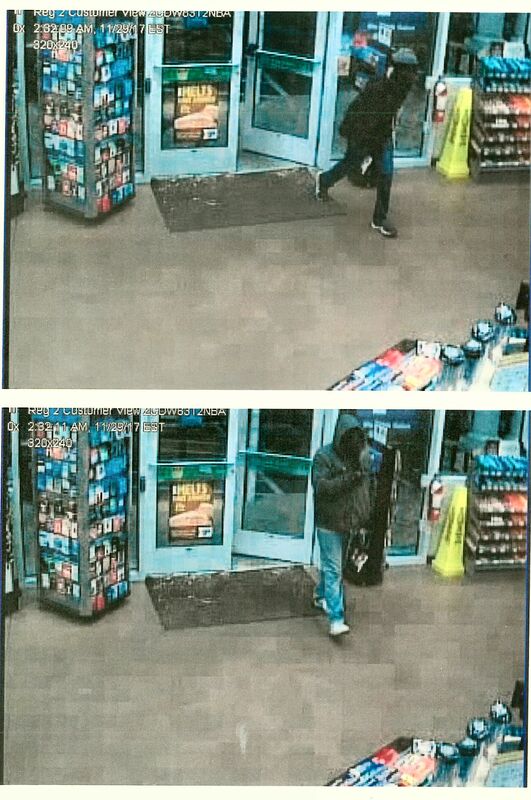 On November 29, 2017, at approximately 2:30am, the Claremont Police Department responded to a report of an armed robbery at the Cumberland Farms convenience store located on Pleasant Street in Claremont, NH. Initial investigation at the scene revealed that two male subjects wearing masks entered the store, threatened the clerk with a weapon, and left with an undisclosed amount of money from the cash register. No injuries were sustained during this incident. One suspect is described as a white male, thin build, dark hair, wearing a dark colored jacket, dark blue jeans, gray sneakers, a green or gray hat/mask, and tan gloves. The other suspect is described as tall, stocky build, wearing a green or gray Carhartt-style hooded jacket, black mask, light blue jeans and white sneakers. Pictures of the two suspects are attached to this press release. Anyone with any infom1ation is urged to contact Claremont Police Detective Casey Piehl or Detective Colby Casey at (603)542-7010. Calls can also be placed to the tip line at (603)542- 7026.